LOS ANGELES – Twenty-eight people-including members of the clergy, community members and striking Walmart workers-were arrested outside a Walmart store in Los Angeles today calling on the company and its owners-the Waltons-to end the illegal threats to and retaliation against workers calling for $15 an hour and consistent, full-time work at the country’s largest private employer. The group was joined by hundreds of Californians who rallied outside the store in Pico Rivera, the site of the first Walmart strikes in 2012. Since earlier today, when striking workers held the first-ever sit down strike in company history in a Crenshaw, CA store, more workers have walked off the job. As a second sit down strike continued in the Pico Rivera store, the group of Californians said America’s largest employer and richest family are driving the income inequality problems that are holding the country back. Even as Walmart brings in $16 billion in annual profits and Walmart’s owners build on their $150 billion in wealth, the majority of Walmart workers are paid less than $25,000 a year. The group of striking workers, from stores throughout California and part of the national organization OUR Walmart, placed tape over their mouths signifying the company’s illegal efforts to silence workers who are calling for better jobs. Striking workers held signs with an historical nod to those of the first retail sit-down strike at Woolworth in 1937, when retail workers at the then-largest retailer in the country called for the company to increase pay, provide a 40-hour work week. The Walmart workers’ signs called for the company to stop the retaliation against workers who have spoken out. 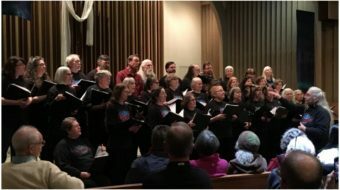 To date, workers at more than 2,100 Walmart stores nationwide have signed a petition calling on Walmart and the Waltons to commit to paying $15 an hour and providing consistent, full-time hours. 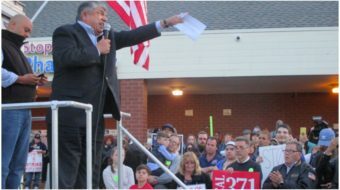 After taking the petition to members of the Walton family, workers’ supporters committed to return to stores on Black Friday and protest if jobs aren’t improved by then. A growing number of Americans say Walmart and its owners are robbing workers of a decent living by paying the majority of workers less than $25,000 a year. The Walton family, which controls the Walmart empire, is the richest family in the U.S.-with the wealth of 43 percent of American families combined. While many Walmart workers are unable to feed and clothe their families, the Walton family takes in $8.6 million a day in Walmart dividends alone to build on its $150 billion in wealth. Walmart brings in $16 billion in annual profits. 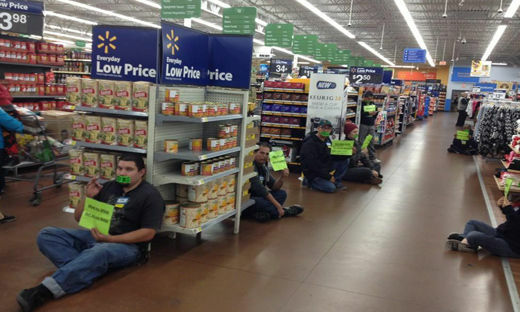 The sit-down strikes and protest come on the heels of a New York Times story on how persistent understaffing at Walmart stores is contributing to wasted food, un-stocked shelves and lower sales. For the past three years, workers have been raising concerns about understaffing and the impact on the company’s wellbeing with managers, shareholders and executives. Investors and analysts are also reacting today to the company’s third-quarter financial reports, which indicate that persistent staffing problems are keeping the company from improving customer traffic and growing the business. OUR Walmart members have made significant strides toward creating change at the country’s largest private employer. Most recently, after public calls from the organization for Walmart to raise pay, the CEO committed to raise wages for the company’s lowest paid workers. Walmart improved its pregnancy policy recently after OUR Walmart members, who are also shareholders, submitted a resolution to the company about its pregnancy policy. And, responding to OUR Walmart members’ growing calls on the retailer to improve access to hours, Walmart rolled out a new system nationwide that allows workers to sign up for open shifts in their stores online.